Losing weight is an uphill battle. Anything that can give you a little extra boost or help you shed one extra pound is worth exploring. While some supplements help, others are a waste of money or aren't useful for losing weight. Vitamin E is one such supplement. While it serves many purposes in your body, it's not helpful for losing weight. Since vitamin E is a fat-soluble supplement, it may seem counterintuitive to take extra if you're overweight. However, just because you have an abundance of vitamin E in your body doesn't necessarily mean that you can use it. An article from Oregon State University suggests that obese people may need to supplement with vitamin E.
Even though an obese individual might have more vitamin E flowing through the bloodstream than normal, his body can't use it as effectively. As fat cells become full, they stop accepting nutrients, including vitamin E.
Unfortunately, just because obese individuals have a difficult time absorbing vitamin E doesn't mean that a supplement will help with weight loss. Vitamin E benefits your health, but doesn't help you drop weight, says an article from Examine.com. Vitamins A, B and D are better for that. As simple as this may sound, weight loss boils down to a simple formula: calories in versus calories out. You need to burn more calories than you take in to lose weight. In order to help you lose weight, vitamin E would have to help you burn more calories. Currently, there's no evidence to suggest that it can. That doesn't mean that you should completely discount vitamin E; it has other benefits that help your overall health. The National Institutes of Health states that vitamin E acts as an antioxidant in your body, meaning it can help prevent diseases like atherosclerosis that are caused by excessive free radicals. Studies on vitamin E are relatively inconclusive at this point. It doesn't lower your risk of heart disease or cancer, according to an article from the Harvard School of Public Health. In fact, it increased the risk of prostate cancer in men when taken at 400 international units per day. Chances are you get enough vitamin E from your diet. That's because it's a fat-soluble vitamin, meaning you can store it in your fat cells for later use. This also means you need to eat fatty foods to boost your vitamin E levels. Sunflower seeds, almonds and peanuts are particularly high in antioxidants. If you decide to supplement with vitamin E, you should avoid taking a high dose since the body has a hard time getting rid of it. According to an article from National Health Services, less than 540 milligrams per day is unlikely to cause harm. Should You Take Vitamin E? It may be unnecessary to take a supplement, however, since most of the benefits are in question. Berkeley Wellness no longer recommends vitamin E supplementation, because studies on the vitamin were so disappointing. 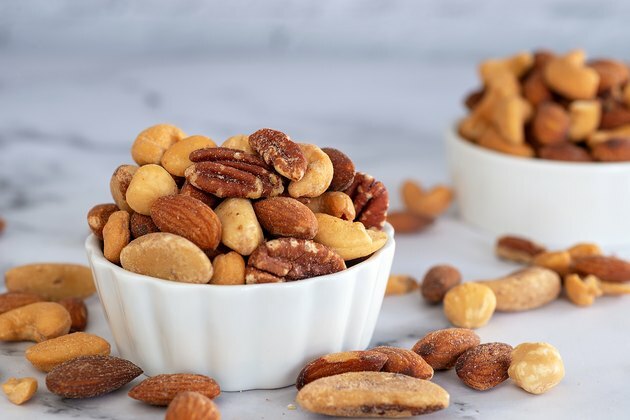 If you decide to take a vitamin E supplement for health benefits, make sure you take it with some type of fatty food, like an avocado or a handful of nuts. Since the vitamin is fat soluble, it needs fat in order to be absorbed. Without eating a fatty food, you'll likely be wasting your money on the supplement. Berkeley Wellness: Should Anyone Take Vitamin E?